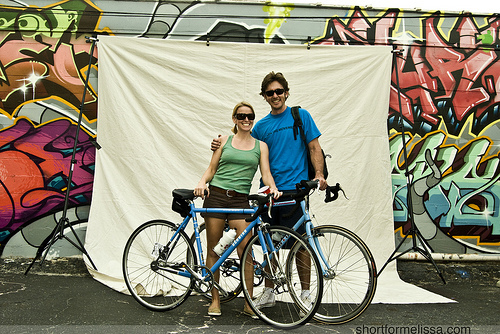 Jess and Dano Kinnee opened Retro City Cycles in March 2007, and Greenway Bicycles in January 2010, to share their love of cycling with everyone in the Central Florida area. Dano has been working in and managing bike shops since 1992, and it was always his dream to run his own shop. Dano is a graduate of the Bill Woodall Bicycle Mechanics School, which certifies him as a USCF (United States Cycling Federation) bicycle mechanic, and DT Swiss-Certified wheel builder. He is also an expert mountain bike racer, staying very involved in local races and club rides in the Southeast. Jess is a graduate of the University of Wisconsin-Madison, as well as an ACE-Certified group fitness instructor and personal trainer, and registered yoga teacher through the Yoga Alliance. Jess created the Dirty Divas, a ladies mountain bike club, encouraging more ladies to join the sport! She leads group rides throughout the week, and teaches yoga in both Orlando and Ocala. At Retro City Cycles and Greenway Bicycles, we continue to look for ways to make your cycling experience better, through new products and excellent customer service. We invite you to bring your bike in to Retro City Cycles and Greenway Bicycles, where we guarantee your bike will ride faster!! Both shops are active members and sponsors of Retro Racing, the Florida Bicycles Association, IMBA (International Mountain Bike Association), OMBA (Ocala Mountain Bike Association), Hal’s Pals, Gone Riding Races, Orlando Bike-O-Psychos, and the MS 150 Bike Tour.